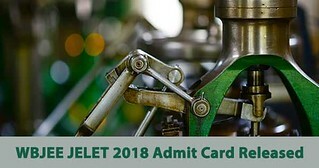 JELET Admit Card 2018 has been released on 18 June 2018 byWest Bengal Joint Entrance Examinations Board for 2nd-year degree course in Engineering, Tech and Pharma. The candidates who had filled the application form between 20 March 2018 to 20 April 2018 can download the WBJEE JELET admit cards from the link provided below. It is compulsory for a candidate to bring JELET 2018 admit card at the exam venue and will not be allowed to give the exam in the absence of the admit card. Students are advised to ensure that the details in JELET admit card are correct and free from any error in order to avoid any inconvenience. Candidates should also keep WBJEE JELET Hall Ticket at a safe. The exam for JELET 2018 is scheduled to be held on 24 June 2018. To get the latest updates on JELET 2018, you can visit the link mentioned below. JELET 2018 is conducted by West Bengal Joint Entrance Examinations Board that was created in 1962 for the purpose of holding a Common Entrance Examination for admission in engineering courses at undergraduate level in the state of West Bengal. Step 1- Go to the link provided below. What to carry on the day of the exam? On the day of the WBJEE JELET 2018, candidates must make sure that they carry JELET admit card 2018 along with a valid photo ID. Candidates won’t be allowed to enter the exam hall and write the examination if they fail to carry their JELET admit card and photo ID. Candidates must note that the photo ID issued by the government will be accepted.